Background: Outreach echocardiographic services led by cardiac sonographers may help district level hospitals in the management of patients suspected to have cardiac anomalies. However, the safety and utility of such an approach is not tested. Methods: We retrospectively reviewed our experience of patients seen in the outreach visits by the echocardiographers alone and subsequently reviewed in the pediatric cardiology clinic. Comparison between the diagnosis made by the echocardiographer and the consultant pediatric cardiologist were done. We defined safety as no change in patient management plan between the outreach evaluation and the pediatric cardiology clinic evaluation, and we defined usefulness as being beneficial, serviceable and of practical use. Results: Two senior echocardiographic technicians did 41 clinic visits and over a period of 17 months, 623 patients were seen. Patients less than 3 months of age constitute 63% of the total patients seen. Normal echocardiographic examinations were found in 342 (55%) of patients. These patients were not seen in our cardiology clinic. Abnormal echocardiographic examinations were found in 281 (45%) of patients. Among the 281 patients with abnormal echos in the outreach visits, 251 patients (89.3%) were seen in the pediatric cardiology clinic. 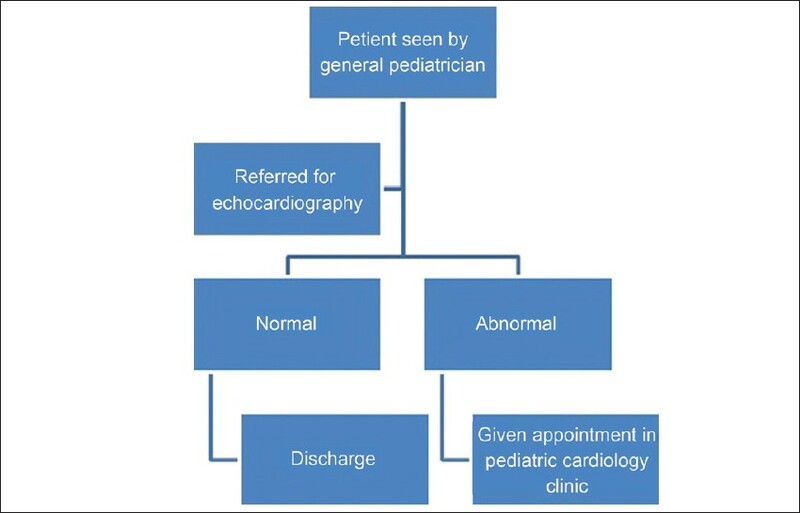 Comparing the results of the outreach clinic evaluation to that of the pediatric cardiology clinic, 73 patients (29%) diagnosed to have a minor CHD turned to have normal echocardiographic examinations. In all patients seen in both the outreach clinics and the pediatric tertiary cardiac clinics there was no change in patient's management plan. Conclusions: Outreach clinic conducted by pediatric echo sonographers could be useful and safe. It may help in reducing unnecessary visits to pediatric cardiology clinics, provide parental reassurance, and help in narrowing the differential diagnosis in critically ill patient unable to be transferred to tertiary cardiac centers provided it is done by experienced echosonographers. The availability of pediatric cardiac care units is limited in most parts of the world. In developing countries, pediatric cardiac care centers are concentrated in major cities, cater to enormous number of children and are not accessible to vast segments of population. It may be difficult to bring the child for echocardiographic diagnosis to the clinic for a variety of financial, social, and other practical reasons. Some children may have suspected innocent murmurs only for whom the entire exercise might not be cost effective, whereas some patients may be in the ICU or NICU, and mechanically ventilated which make their transfer for pediatric echocardiography evaluation difficult and sometimes unsafe. Referral of all the patients needing an echocardiography to a referral center overwhelms the clinic with patients and increases the waiting list and the time from referral to clinic visits. Due to the limited number of pediatric cardiologists in the region as well as in the country, it is difficult to run regular and frequent outreach clinics by consultant pediatric cardiologists. To overcome this we sought to do outreach pediatric cardiology visits by qualified and experienced echosonographers under direct supervision of a consultant pediatric cardiologist. The safety and utility of such an approach is not scientifically proven. The aim of the study is to study the usefulness and safety of such clinics and echocardiographic evaluation conducted by echosonographers. We retrospectively reviewed the number of patients seen in the outreach visits by the echocardiographers as well as those of them reviewed in the pediatric cardiology clinic. Prince Sultan Cardiac Center (PSCC) Qassim provides a pediatric cardiology service for the region as well as for nearby province like Hail. It is serving a total population of 2 million (total Population of Al Qassim is 1.2 million, that for Hail is 0.6 million and that of Dawademy is 0.2 million). Patients suspected to have congenital heart defects (CHD) in the province district general hospitals (DGH) and primary health clinics (PHC) are referred to PSCC-Qassim. In distant areas of the province as well as in other areas of other province there is no pediatric cardiologist. Our protocol of conducting such clinics is that patients will be seen by a general pediatrician first. If he/she suspects a cardiac anomaly he/she will schedule the patient for the outreach clinic. During the outreach clinic [Figure 1] echocardiographers will do complete and systematic echocardiography for the patient in the presence of the general pediatrician who completes history and physical examination. Echocardiographers conducting the outreach visits are well trained. They are doing echocardiography in the pediatric cardiology clinic as well as for inpatients. They are doing on call service with good diagnostic capabilities for emergency and critically ill patients. Echocardiography was performed in a systematic segmental fashion according to the published guidelines for performing pediatric echocardiography. At the end of every outreach visit the echocardiographer will bring the list of patients seen to be discussed with the consultant pediatric cardiologist. If the patient is having a normal echo he/she will be discharged from the cardiology point of view, if the ECG is normal with no evidence of arrhythmia as evaluated by the general pediatrician. If there is any abnormality, even a minor one, the patient will be given an appointment with the pediatric cardiologist. Patients diagnosed to have significant cardiac problems or prostaglandin dependant lesions will be given urgent appointments with the pediatric cardiologist, or will arrange an urgent transfer to tertiary cardiac center for more evaluation and management. Echocardiography was done either by Echo machines at the primary DGH or by a portable GE machine (VIVID I) taken by the echocardiographer from PSCC-Qassim. The data were recorded in a database and were retrospectively analyzed using the SPSS statistical software. The definition of safety is freedom from danger, risk, or injury. In our condition safety can be considered in the context that there is no change in patient management plan between the outreach evaluation and the pediatric cardiology clinic evaluation. The definition of useful is having a beneficial use; serviceable and being of practical use. In our condition, usefulness can be considered that comparing doing echocardiographic service by echocardiographers in DGH is better than no service at all. Also unnecessary pediatric cardiology clinic visits were avoided for children with normal screening echocardiography. It also helps in the clinical management of critically ill patients unable to be transferred to a cardiac center for cardiology evaluation. The study was approved by the center research committee. Two senior echocardiographic technicians did 41 clinic visits to 4 DGH in 3 regions in the province of Al Qassim and Hail. The visits were conducted once or twice per month or as required, with liaise with the visited hospitals, according to the waiting list. Over a period of 17 months (from February 2010 to June 2011) 623 patients were seen. Patients less than 3 months of age constitute 63% from the total patients seen [Table 1]. Normal echocardiographic examinations were found in 342 patients (55%). These patients were not seen in our cardiology clinic to continue follow up with their general pediatrician. Abnormal echocardiographic exams were present in 281 patients (45%). The commonest CHD detected were ventricular septal defects (VSD), patent ductus arteriosus (PDA) and atrial septal defects (ASD) secundum type, accounting for 25%, 16.4%, and 11.4%, respectively, from the group having abnormal echocardiographic examinations. Among the 281 patients with abnormal echos in the outreach visits, 251 patients (89.3%) were seen in the pediatric cardiology clinic. Complete evaluation by pediatric cardiologist was performed for these patients including doing echocardiographic exams. 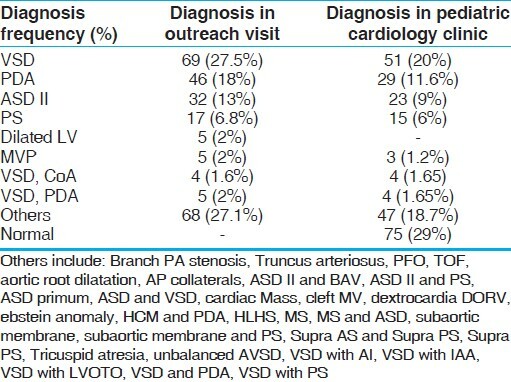 During the pediatric cardiology clinic evaluation, 73 patients (29%) diagnosed to have either small muscular VSDs, Small ASDs, Hypertrophic myocardium, Dilated left ventricle (LV), branch pulmonary artery (PA) stenosis or small/tiny PDA in the outreach clinic turned to have normal echocardiographic examinations [Table 2]. The error rate was 29% with no adverse events or change in patient management plan. Thirty patients (11%) were having abnormal echo exams in the outreach clinic were not seen in the pediatric cardiology clinic at PSCCQ. 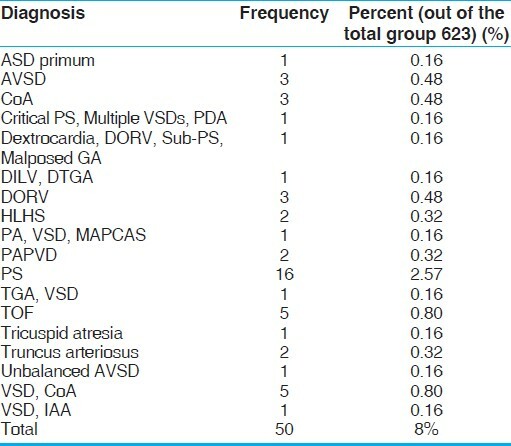 The diagnosis of the 30 patients were AVSD (3), ASD primum (1), ASD, VSD (1), Bicuspid aortic valve, VSD, PDA (2), Cardiac Mass (2), Critical PS, Multiple VSDs, PDA (1), Dextrocardia, PDA (1), DILV, DTGA (1), DORV (3), HLHS (1), Kawasaki disease (1), TGA, VSD (1), TOF (3), Truncus arteriosus (1), VSD, CoA (1), HCM (2), MVP (2), Critical PS, Multiple VSDs, PDA (1), PHT (1), and SVC obstruction (1). Such patients either were referred directly to other cardiac centers in the kingdom; continue follow up at the referring hospital by the general pediatrician and scheduled to be seen by the next outreach clinic visit; or have been seen by a consultant pediatric cardiologist from other centers through an outreach clinic. Twenty percent of patients required referral for cardiac intervention in the form of either cardiac catheterization (PDA device closure, ASD device closure or for balloon pulmonary valvuloplasty), or cardiac surgical intervention (CoA repair, VSD closure, DORV repair, TOF repair, etc) [Table 3]. There are few reports of a successful outreach service led by pediatric echocardiographic technicians. The majority of new cases in such outreach clinics are children with innocent murmurs referred by the general pediatricians to rule out the presence of cardiac anomaly. The incidence of innocent murmurs is over 50% at some point during childhood, the vast majority of these children have normal hearts. It has been established that a good physical exam and an EKG is enough in patients with innocent murmurs. Better education of parents and pediatricians would reduce the number of unnecessary echocardiograms, and reduce the load on cardiology clinics. Best practice dictates that a strong suspicion of CHD requires assessment with an echocardiogram. Triaging asymptomatic children with murmurs using echocardiography is demanding of time and resources, and waiting times for new nonurgent appointments are often many weeks. , Some will argue that it's not optimal for the sonographers to be doing these studies without adequate supervision because there is always the possibility of missing important diagnoses. 55% of patients seen through our outreach visits program were having normal echocardiographic exams. These patients benefited from the outreach program and there was no need to be given a pediatric cardiology clinic appointment. Early relieve of parental concerns also was achieved. Outreach clinic visits helped in the diagnosis of CHD requiring intervention either in an emergent base or electively. This will help in the process of referring patients to tertiary cardiac centers for further evaluation and possible intervention. 73 patients (29%) diagnosed to have minor forms of CHD in the outreach clinic turned to have normal echocardiographic examinations [Table 2]. This could be explained by the natural history of VSDs, ASD secundum and PDA with tendency for spontaneous closure within the first few months of life. [7,8] In addition to that some PFOs may be diagnosed as secundum ASD. This may not be considered as a failure because the echo cardiographers have low threshold to diagnose such lesions e.g. PFO/ASD. There were no changes in patient's management plan between the outreach clinic diagnosis and the pediatric cardiology evaluation. In addition to that the rule of the echo cardiographer is to do echo only. He is not the one having the eligibility to discharge the patient. The attending general pediatrician in addition to supervising pediatric cardiologist, are the one referring or discharging patients. In addition to that no patient was sent for surgery based on echo cardiographer evaluation alone. Patients have to be reevaluated by a consultant pediatric cardiologist. Outreach clinic conducted by pediatric echosonographers could be useful and safe. It may help in the reduction of unnecessary visits to pediatric cardiology clinics, in parental reassurance and in narrowing the differential diagnosis in critically ill patient unable to be transferred to tertiary cardiac centers. It needs to be done with an experienced echosonographer. For any observed or suspected cardiac anomaly the patient should be referred for evaluation by a pediatric cardiologist. 1. Casey F, Brown D, Craig BG, Rogers J, Mulholland HC. Diagnosis of neonatal congenital heart defects by remote consultation using a low-cost telemedicine link. J Telemed Telecare 1996;2:165-9. 2. Allen J, Dickinson DF, Ramachandran A, Thomson JD. Development of a cardiac technician led paediatric echocardiographic service - experience from a district general hospital in the United Kingdom. Cardiol Young 2005;15:299-301. 3. Kadivar M, Kiani A, Kocharian A, Shabanian R, Nasehi L, Ghajarzadeh M. Echocardiography and management of sick neonates in the intensive care unit. Congenit Heart Dis 2008;3:325-9. 4. Murugan SJ, Thomson J, Parsons JM, Dickinson DF, Blackburn ME, Gibbs JL. New outpatient referrals to a tertiary paediatric cardiac centre: Evidence of increasing workload and evolving patterns of referral. Cardiol Young 2005;15:43-6. 5. Geggel RL. Conditions leading to pediatric cardiology consultation in a tertiary academic hospital. Pediatrics 2004;114:e409-17. 6. Wagstaff MH, Rigby ML, Redington AN. Increasing workload and changing referral patterns in paediatric cardiology outreach clinics: Implications for consultant staffing. Heart 1998;79:223-4. 7. Miyake T, Shinohara T, Nakamura Y, Fukuda T, Tasato H, Toyohara K, et al. Spontaneous closure of ventricular septal defects followed up from <3 months of age. Pediatr Int 2004;46:135-40. 8. Axt-Fliedner R, Schwarze A, Smrcek J, Germer U, Krapp M, Gembruch U. Isolated ventricular septal defects detected by color Doppler imaging: Evolution during fetal and first year of postnatal life. Ultrasound Obstet Gynecol 2006;27:266-73. 9. Dowie R, Mistry H, Rigby M, Young TA, Weatherburn G, Rowlinson G, et al. A paediatric telecardiology service for district hospitals in south-east England: An observational study. Arch Dis Child 2009;94:273-7.